Poster Boy trains his razor on the MoMa's subway installation at the Atlantic/Pacific stop in Brooklyn. 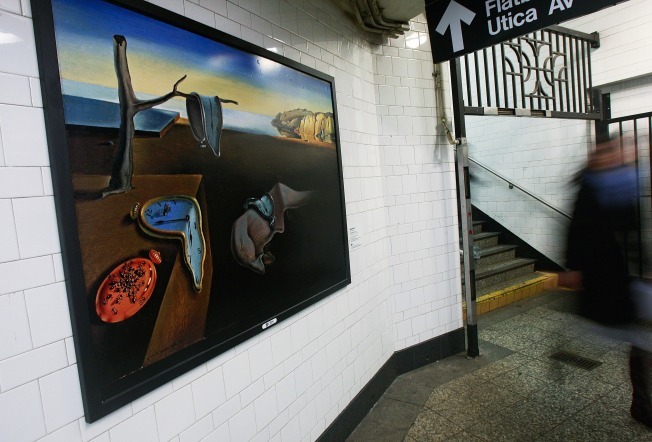 A rider walks past a reproduction of a Salvador Dali painting in the Atlantic Avenue subway station, as part of MoMa's advertising installation. It's been less than a month since a series of Museum of Modern Art (MoMa) subway ads went up in a Brooklyn subway station, and last weekend, those ads were remixed by "vandals" with razors, tape and a bit of imagination. One of the vandals was from the Poster Boy collective, while the other was Doug Jaeger, a marketing executive for the ad agency Happy Corp which not-so-coincidentally created the MoMa campaign. In a comment to Gothamist, Jaeger all but confirmed the existence of the Poster Boy collective, as opposed to the NYPD-held belief that he's just one rogue artist. Earlier this month, 27-year-old Henry Matyjewicz was arrested by undercover NYPD at an art event where he was set to create legal "Poster Boy" work. At the time, it was thought that there was just one Poster Boy. But over the past few weeks more and more people are believing that it is in fact a collective, or even a movement, of sorts. But this brings us to the reason for quoting "vandals." Despite a PR response to the contrary from MoMa's Kim Mitchell, it's not far reasoning to figure this ad remixing was all part of the plan. "I can confirm for you that the vandalized ads were taken down [Monday] by CBS Outdoor and will be replaced by Wednesday," Mitchell claimed. However, a writer on Free Williamsburg smells an obvious publicity stunt, writing, "This makes the project seem calculated and doesn't bode well for the MoMA or Poster Boy." This led Keith Haskell a comment by a director who shot the widely-seen Spending Time With Poster Boy YouTube video. "Doesn't bode well? Legal or not, why would a member of the Poster Boy team turn down the opportunity to mash up posters?" Haskell asked. Doug Jaeger told NY Mag that he's nervous about how the MoMa will view his actions, but asks, "if someone who is getting acclaim as an artist does something to your campaign, does it make it less valuable or more valuable?" In the end, that'll be up to the MoMa and the art world to decide.